A ‘Facebook Stories’ app has also been launched to celebrate the feat which invites users to share how Facebook has changed and influenced their lives since they started using it. Zuckerberg will be appearing in a rare TV interview by anchor Diane Sawyer on ABC’s ‘World News’ tonight. It is expected that apart from discussing the impressive feat he’ll directly talk about the recent privacy settings fiasco for the first time and the up coming movie based on his life will also feature in the interview. Mark Zuckerberg may be celebrating the 500 million mark but this is actually just half the journey for the former Harvard student who expressed immense confidence at the Cannes Lions International Advertising Festival last month about reaching 1 Billion users some day. He was reported as saying that it is “almost a guarantee that it will happen”. This may sound over confident but the rate at which users keep growing, it may happen in the not too distant feature. 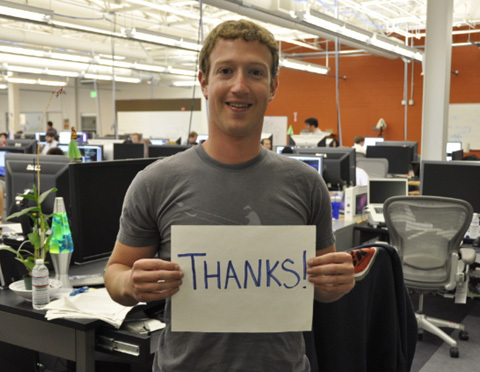 After all it was only five and a half months ago when Facebook celebrated its 6th birthday and 400 million users. This may mean 600 million users by the end of the year and if the trend keeps growing, 1 billion is not too far. It’s obvious that not only Facebook itself but the makers of ‘The Social Network’ (The Facebook movie) were also keeping tabs on the company’s growth and were confident of it crossing the 500 million mark before the film’s release. The tag line of the movie is “You can not reach 500 million friends without making a few enemies” and it appeared a few weeks ago when Facebook was yet to achieve the goal.